A simple question: which duo-sized tent would you spend your cash on for the fickle British climate? The Nallo is well-proven, and if build quality was the only consideration in this test it would be top dog. With a 4-season flysheet, massive porch, clever zip-up vent at the tail, top quality poles and pegs this thing goes up and down effortlessly. If there’s any slack in the material it rustles in wind and can be a little noisy, and the tent doesn’t exactly keep the bright sun at bay come the morning. But the big drawback is the price. You’re buying a Rolls Royce here, so are you sure you can justify it? You’d have to be sleeping out a lot for it to win over the other models here. But if you really want it, you will love it. The Exped Mira is a great little tent that’s very easy to assemble, thanks to pole sleeves being colour-coded and numbered. Ultra lightweight with an impressive packed size, the two doors and two porches are a huge bonus for two. Headroom tapers, but is spacious at one end, although it does feel cosy with two. It pitches inner first which is not so great, especially if it is raining, but the flysheet offers the porch areas and tent inner good protection from the rain. 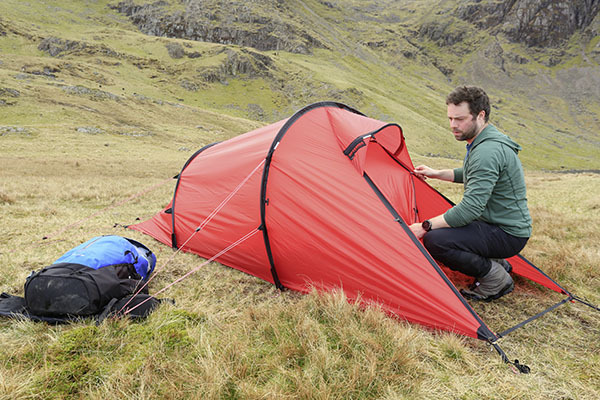 The inner has lots of mesh for good ventilation too, great for a 3-season tent, and is also a natural colour inside. A strong contender to the MSR Hubba Hubba, but it will set you back an extra £100. Part of Vaude’s Green Shape range made with eco-friendly materials, the Taurus UL is a reliable 3-season, two-person tent. After an uncomplicated outer-first pitch, the domed design stood firm against overnight wind and rain, and five guy lines added further stability and tautness to the flysheet. A big plus is the clever porch door, which boasts four zips for versatile access and venting. The vestibule itself isn’t huge but the inner tent, made with warm yellow fabrics, feels capacious and would sleep two comfortably. You only get the single entrance and its RRP has crept up by £65 since being awarded Best Value in a 2016 Trail test, but this remains a trusty, well-designed tent. A strong semi-geodesic tent capable of withstanding all seasons, with a heritage you can’t knock. But what’s it like to live in? This Scottish-designed 4-season tent pitches without fuss. The poles are colour-coded and the tent is very stable once up. The inner and outer also erect as one, making it ideal for rushed pitching in bad weather. The semi-geodesic pole structure tensions the fly, so all you really need to do is peg it out. The fly sits low to the ground, which keeps out drafts and windblown rain, and is offset by a clever ventilation system of triangular vents under the cross points of the poles on the sides and another in the tail. The interior is spacious, with a level-ish roofline so you could have your head at either end. I’m 5ft 7in and could stretch my arms out above my head! Sleep was good with little noise. A good tent for most conditions – very versatile. This isn’t the lightest tent, though I’d happily take that extra weight in return for the stability it offers. The pegs are very good but lack cords, which are essential for finding and comfortably pulling the pegs out. There were a couple of finesse issues... The Yunan alloy poles were strong but the corded plastic seat of one of the poles came off when pulling out of the eyelet, and re-threading was fiddly. The zip snagged on the material around the door too. And the porch was fairly small – two 60-litre ’sacks wouldn’t fit, so one ended up inside the tent, which ate into space. I could live with these niggles but at £400 they shouldn’t be there really. This is a great tent for most UK conditions. While not the lightest, it is strong and easy to pitch with thoughtful touches that outweigh my gripes with the porch and the poles. This well priced two-person tunnel-tent is designed for year-round use. Do the facts match the impressive figures? Pitching this tent is a simple job, thanks to colour-coded poles and sleeves that make identifying what goes where a doddle. Getting it steady enough to chuck gear inside out of the rain is fairly quick too, aided by the outer and inner pitching as one. Inside headspace is pretty generous, and there’s plenty of room for two plus extra bits of gear. There are several mesh storage pockets for bits and bobs you want to hand, plus a couple of hanging hooks. The porch door has multiple zips allowing it to be rolled up, down, left or right, which is great for checking out the weather without exposing yourself to it. The flysheet comes down low to keep breezes out, while glow-in-the-dark guy adjusters help prevent night-time stumbles. Double eyelets on the ladder-lock straps where the poles attach to the base of the flysheet allow a second set of poles (not incl) to be used for extra strength in winter. Being a tunnel tent it requires a bit of after-pitch adjustment to fully stabilise, and because it’s tapered towards one end you have to lie with your head near the door – so careful orientation for wind and slope direction is key. The alloy pegs are flimsy and several bent immediately on rocks. But the biggest gripe is the porch – it’s tiny. 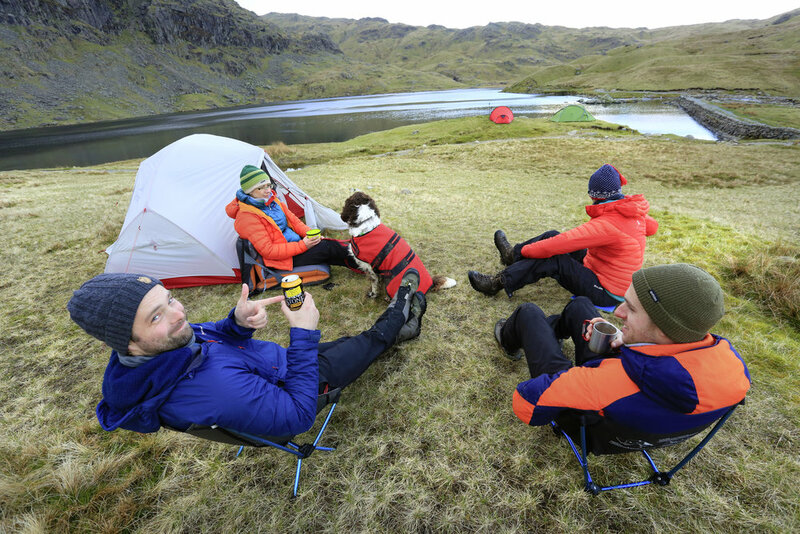 There’s barely enough space for one large pack, and anything you store in there (such as your boots, stove or wet kit) has to be clambered over when getting in or out of the tent. This is made even more of a challenge by the single front guy-line that bisects the door, meaning you have to exit either left or right while ducking to avoid catching your back on it. In the end I unpegged this guy and did without, but in windier conditions this might not be an option. Porch grumbles aside, this is a superb tent and what you get for your money is impressive. For two with limited baggage, it’s nearly perfect. Super light, super stylish and ultra compact when packed. Is there anything to complain about with the Hubba Hubba? On paper the Hubba Hubba is light, it’s compact and it’s good value for money in its class. And for many, those three key things will make the Hubba Hubba the one to buy. Out of the stuffsack, the poles are connected by bungees and almost assemble themselves in a Transformer-like manner into a freestanding single-piece frame. The inner and outer attach easily to the poles without the need for threading poles through fabric sleeves. In use, the best thing about this tent though are the two excellent porches and entrances. For one woman and her dog it’s a little more than you need. For two people though it is ideal, as you have your own entrances where you can store a large rucksack under the flysheet – which stays protected from the rain when the door is open – and still have clear access to the tent without having to clamber over gear or each other, which is a problem for single-door tents. Inside the Hubba Hubba feels roomy, with plenty of headroom for two to sit up, and a little extra length for storage. There’s one mesh pocket at the head end for quick access items, and a central loop from which a light or loft could be attached. The materials ooze quality and feel very lightweight, but remain strong and withstood doggy claws no problem. On an early May wild camp with rain, hail, gusty winds at times, and temperatures dipping to near freezing, the Hubba Hubba was a little on the chilly side. There’s a 15cm gap between the flysheet and the ground, two ‘kickstand’ vents (held open up by little props) and lots of mesh in the inner, which provides fantastic ventilation and fresh air but means it’s cooler in colder conditions. With a -18° C sleeping bag, a nice thick airmat and a fluffy spaniel for a footwarmer I was comfortable though. It stood up admirably against the wind too. The tent is only designed for 3-season use – and in wilder, wetter conditions driving rain could also get in under the porch fly. The inner-pitch-first design, although easy, is also not ideal if pitching in the rain. It’s easy to fall in love with the Hubba Hubba for its weight, portability and quality – which for 3-season backpacking outweighs its winter shortcomings. For me it’s definitely top dog.